It was Little Z’s end of year play yesterday, and I was SO excited. We were almost late as “5 more minutes” at work meant I was rushing to get there in crawling traffic on the verge of rush hour. After much panic and picking the Other Half and Little Z up we found ourselves being the very first attendees and actually about 15 minutes early. As the play was titled “End of year play” and not “Nativity” we had no real idea what the heck it was about and the only information we had was that Little Z was going to be one of the 3 little bears, there would be a red riding hood somewhere, plus others. Every character would have their own costume and most characters would have lines. The hall finally filled up and various mums (and dads) already showed signs of welling up and reaching for tissues before the kids had even reached the stage. The cutest moment ever was when all the various little characters walked into the hall in pairs, two by two and beamed at their parents (some of which were total gonners by this point). A whole mixture of animals, storybook characters, some stars, angels and what looked like an inn keeper. I think it was definitely a twist on the nativity but the plot was one I’d never ever seen before. The cow got a bit bored and legged it off the stage. A keyworker had to chase him down the hall and herd him back again. There was no Mary at all. I’m not sure why, as there was a Joseph, and can only presume she may have been at home a bit poorly with one of the many horrible winter bugs that have been going around. The little lamb got a bit too hot in his outfit, stripped off and eventually went to his mummy and daddy for a bit of a cuddle preferring to watch the show from the comfort of their laps. The two stars seemed to have a heated discussion about something very important until they were shushed. The angels made themselves comfy and put their feet up to relax a bit. One pig out of the two tried to jump off his chair after getting tired of sitting down. My own little bear missed the cue to say his line as he was too busy waving at us and making us laugh by pretending to eat from his porridge bowl. Attempts to mime at him to say his line didn’t really work. Thankfully the other two bears weren’t eating porridge at the time and concentrating on their role. Goldilocks had the loudest singing voice I’ve seen on a 3 year old and sang her little heart out. She even did some moves and at one point danced clean off the stage. One of the angels threw one of her pom poms straight into the audience after some over enthusiastic shaking. It was kindly returned after a brief look of panic on her face. The little lamb eventually toddled back onto stage and played with cars happily in the background. The other little lamb kept shouting across to his Mummy to ask where his Daddy was. So the plot was pretty awesome really and we were all a big mess of happily choked up throughout the entire thing. We couldn’t take pictures of any of it but we are definitely definitely going to buy the DVD. And maybe ask them what the plot was meant to be! Aww sounds a bit like my daughters play, it was the nativity but twenty 3 year olds all looking for their mum and dad is rather amusing. It’s the perfect way to spend an hour though and sounds like you had fun watching (even if you weren’t sure on what the play is) ;). 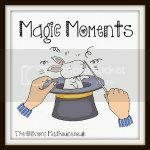 Thank you for linking up to #magicmoments. Hehe, what a fabulous end of year play! It’s great when they’re all so little that none of them know what’s meant to be going on so you definitely have no idea! I must admit I chuckled out loud at some of this, remembering watching this situation with all of mine. Popping in from Magic Moments. Sounds like they all had a lot of fun putting on their show! They are so unpredictable at that age lol. Well, you can always predict there will be some mischief!